How do you create inviting and authentic urban environments where people feel at home? Countless community engagement workshops, studies by consulting firms, and downtown revitalization campaigns have attempted to answer this age-old question. In Urbanism Without Effort, Chuck Wolfe argues that “unplanned” places can often teach us more about great placemaking than planned ones. A whirlwind global tour, Urbanism Without Effort offers readers inspiration, historical context, and a better understanding of how an inviting urban environment is created. "A plea for a renewed commitment to authentic urbanism and an invitation to learn from history as our cities enter a future of unprecedented change." "One of Chuck Wolfe's great gifts is an extraordinary photographer's eye for capturing visual images of everyday, but evocative, city life. Another is an uncommonly strong intellectual grounding in urban planning theory. In Urbanism Without Effort, he combines the two in unique fashion to show us how unplanned places can often teach us more about great placemaking than planned ones." "Chuck's work is what happens when art meets science in placemaking. His talent for capturing places being themselves is so important in the placemaker's toolkit, yet can be missed if we are not paying attention. Lucky for us, Chuck is always paying attention and this book is the proof." "This is a must read for those who want to understand in words and pictures what stands behind great cities. We're proud to see a Seattle native son helping to show the way." "Wolfe provides something rare in contemporary urbanist writing—rich illustrations and examples from real life—both historical and current. His writing about the past and the future of urban form offers readers inspiration, historical context, and a better understanding of how a sustainable, inviting urban environment is created." "Nicely put. If you like thinking about the intersection of people and place, you may like this attractively priced book a great deal." "Readers will come away motivated to find, experience and document their own favourite places and find ways to apply effortless urbanism in their own neighbourhood." "...a book of inspiration and aspiration. It makes the reader yearn for places with soul." "...a great ground-level look at how neighborhoods and communities can foster flourishing life in the city." "The jargon-free text makes this book a good option for anyone, but the substance of the message could make for academic reading as well. I enjoyed reading this book for its vignettes of urban living from around the world." In Urbanism Without Effort, Charles Wolfe, a respected voice on urbanism, brings a unique combination of skills as a writer, photographer and land use attorney to present a thought-provoking, practical, and well-illustrated narrative aimed squarely at rapidly evolving cities today. He says that with all of today’s buzzwords—e.g., pop-up, insurgent, green, transit-oriented, new—we lose sight of the fact that the most enduring, vibrant aspects of city life aren’t engineered by professionals. They are the natural result of people coming together in an urban environment. He contends that city life shouldn’t feel like work; it should be effortless. It shouldn’t feel designed; it should be spontaneous. Wolfe argues that before we can create vibrant, sustainable urban areas, we need to understand what happens naturally when people congregate in cities. He offers numerous personal photographs and vignettes carefully selected from lessons learned during a life spent studying how city dwellers interact naturally with each other and the urban environment. 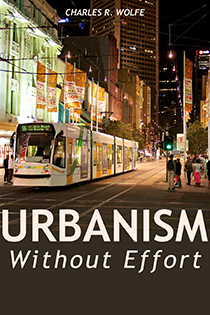 Urbanism Without Effort is a strikingly illustrated, lively, and uncomplicated read that serves as a poignant reminder of the innovative history and promising future of human interaction with the urban form. Check out Chapter 1: The Dynamic Potential of Urbanism Without Effort below, or download the PDF here.